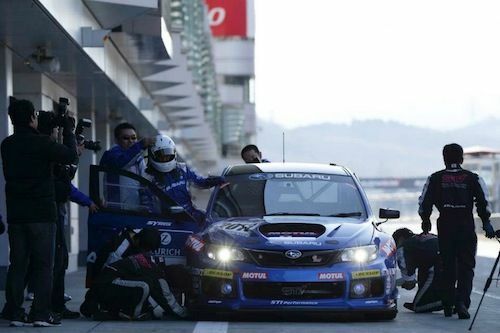 The Subaru STI team has completed the shakedown of the 2013 WRX STI in preparation for the 2013 Nurburgring 24-hour race and their third straight victory. Subaru and STI have just completed the shakedown of the 2013 WRX STI race car that will compete for its third straight 24-hour Nurburgring win. And the STI team is not relying on past success to win this year. The newly built Subaru WRX STI 4-door will offer enhanced performance as the car has been reworked from the car that won last years race. That should be music to Subaru WRX STI fans ears around the globe as the STI team develops new and faster cars that filter down to the production cars they can buy. The newly developed 2013 Subaru WRX STI race car features a larger underspoiler up front to restrict front lift. New overfenders around the rear tire-housing and a defuser has been added on the rear underbody to improve aerodynamics. Other improvements include moving the fuel tank to improve weight balance, and BBS forged magnesium wheels have been used to reduce the unsprung weight of the 24-hour Nurburgring race car. The improvements were made to increase speeds on the fast corners at the Nurburgring. A new sequential gearbox will be coupled to the Subaru Boxer engine when it is sent to Germany in April. The STI Subaru NBR Challenge team consists of veteran driver Toshihiro Yoshida and Kota Sasaki, who will be competing in the NBR for the 3rd time this year. They will be driving the WRX STI NBR Challenge car together with 2 European drivers. Team General Manager Hideharu Tatsumi will be guiding the entire team which includes the dealer mechanics from Japan who have been hand-picked to handle the pit duties and keep the car in the race. The testing of the improvements that were made to the WRX STI Nurburgring car have already gone better than last year, which sets up an expectation for a good result in this years attempt for a third win. Sasaki said the newly designed WRX STI is easier to drive and its best lap time has improved by more than a second over last years car. That should make a big difference in allowing the drivers to keep a faster pace during the 24-hour race. As any race team knows, having a good car is not enough. The drivers, team manager and dealer mechanics will all need to come together and work at “full throttle” in the 24-hour race. The teams goal is to move forward now as a team along with the newly designed 2013 Subaru WRX STI with the aim of a perfect win. Subaru will display its strength to Europe and the rest of the world by winning the race three times in a row.